Hi, all! Hope everyone is well and enjoying my previous post about my vegan guide to Montréal! It was a lot of fun to make and I plan to do something similar for most of the cities I visit on this trip. I am currently staying on a majestic farm just south of Edinburgh in Scotland. I couldn't be happier here. The people I am staying with are SO kind and generous. The land we're on is peaceful, surrounded by rolling fields and hills, rivers, valleys and grazing, gentle creatures like sheep, chickens, hares (I call them bunnies because when I see them I get really excited and turn into my 10-year old self), pheasants, horses and cows. Now more than ever I think somewhere like this is where I need to end up. It's ideal for my mental health and well-being. That being said, Edinburgh is a rad city! Tons of vegan food, most museums and galleries are free, and the centuries-old architecture literally causes me to gasp. My recipe today is for cherry, chai and chocolate lovers. That's me on all three counts. 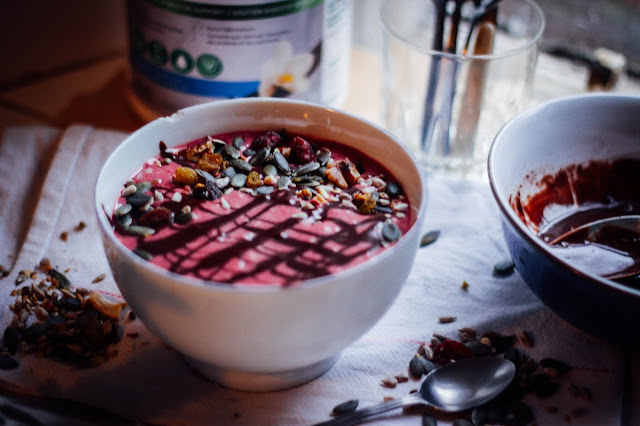 It's a sweet, fruity smoothie full of vitamin C; spices that are protective, therapeutic and regulatory like cinnamon and ginger; aaand the star of the show: fermented vegan proteins+. Genuine Health's fermented vegan proteins+ is a gluten-free, soy-free product that includes seven fermented, plant-sourced proteins. Why fermented? Fermentation allows for better absorption of nutrients and protein and improves gut health and digestion. Beans and other protein-rich plant foods naturally have protective compounds that make it difficult to absorb their nutrition and protein. These compounds are called anti-nutrients: they can cause food sensitivities and disrupt the work of useful enzymes in our bodies, like digestive enzymes. Fermenting these foods disarms the anti-nutrients and unlocks more nutrition in them, in an easier-to-digest form. This is why I prefer to soaking nuts and needs before using them in recipes; it has a similar effect in allowing for more nutrient absorption and less digestive issues / bloating. Vegan proteins that have been fermented can allow for up to 40% more absorption compared to non-fermented. Another thing I appreciate about this fermented vegan proteins+ is the variety of protein sources involved. I am a proponent of eating a colourful mix of foods everyday for maximum nutrition. Some foods can provide a suitable amount of one or a few amino acids, vitamins, minerals or nutrients but fall short for others. So eating a blend of different foods everyday helps to give you a balanced diet rich in all the nutrition your body needs to function optimally. 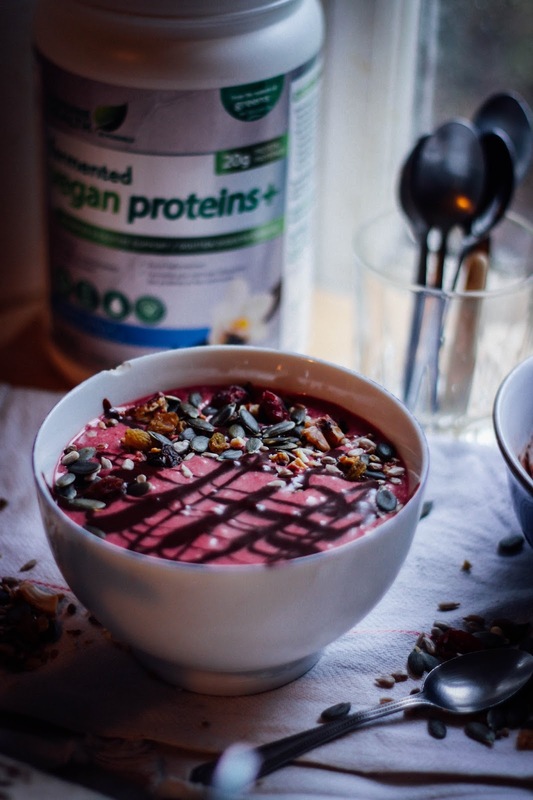 The proteins in fermented vegan proteins+ are from non-GMO, low-allergen, fermented mung bean sprouts, alfalfa, spirulina, quinoa sprouts, pea protein isolate, organic hemp, and brown rice. I like to add a scoop to my smoothies and baked goods for that extra kick of protein and nutrition. Click here to find out where you can buy fermented vegan proteins+, in case you're interested. To make the smoothie: blend all ingredients together until smooth and adjust according to taste (i.e. add more of whatever you like). To make the chocolate: stir together the ingredients until smooth. It might take a moment for the cocoa powder to incorporate into the wet ingredients-- just keep stirring gently. 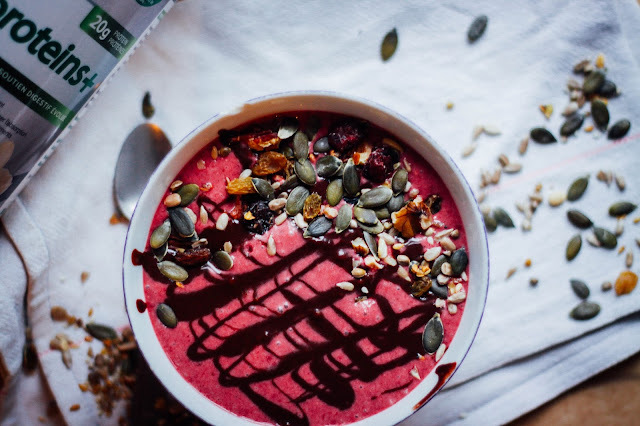 Pour your smoothie into a bowl or glass, drizzle with the chocolate and - optional - sprinkle on some seeds, dried fruits and nuts! Enjoy!